HBO is using the Oculus Rift's virtual reality technology to terrify Game of Thrones fans. I probably wouldn't choose to visit Westeros. Everyone is always dying there. But those fans who are willing to take the risk may want to check out HBO's latest creation: a Game of Thrones virtual reality experience that uses Oculus Rift technology. The interactive attraction is a part of the second annual Game of Thrones Exhibition, a Time Warner-hosted event that is currently being displayed in New York City. After putting on the Oculus Rift headset, players will be transported to the northern wall, the 700-foot ice barricade that separates the Seven Kingdoms from the wildlings and those blue-eyed zombies. The mission, which is called "Ascend the Wall," is only about two minutes long, but is reportedly an intense experience. There are rickety bridges, a White Walker attack, and a frantic escape. Even though the ground doesn't actually move, the environment is so immersive that some players experience balance issues and anxiousness due to their fear of heights. Luckily, players are housed inside a metal cage, so there are plenty of handholds if they're needed. The Oculus Rift is typically used as a tool for futuristic video game development, but it's nice to see the scope of VR technology reaching outside of gaming. 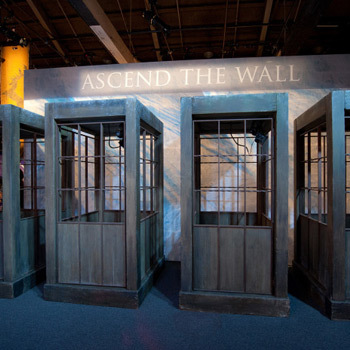 "Ascend the Wall" is more like a virtual tour than an actual video game, and it has obviously stumbled into some interesting storytelling techniques.